Ladakh is a land of stunning beauty. This Himalayan region has a unique landscape as it is the highest desert of the world, rain shadowed from rest of the Kashmir state. Until recently, Ladakh remained untouched and unexplored due to its remoteness. This allowed a variety of unique art and culture to evolve and flourish in the region.One such art is of handcrafting metals in Ladakh. No one can say for sure who introduced this art here but the artisans in villages of Ladakh have been doing this since centuries. 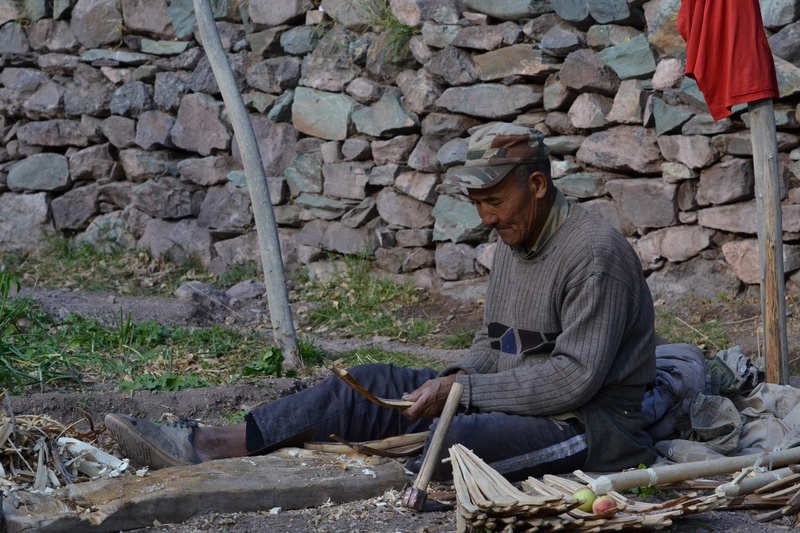 We went for a 6 days trip to Ladakh as part of an expedition by Mountain Homestays. We trekked through Himalayas visiting and staying in various village homestays. Our last village of stay was Tsogsty where we spent an entire day. Here we met a 65 year old metal artisan named Thetan Wangya, who has been practicing copper art since he was 25. He has a very small workshop where he sits on a small cushion surrounded by all sorts of tools he uses for his work. He showed us a small coal fire and a blower that he uses to melt and shape the copper sheets. He also uses silver and zinc in his work. He usually does this work in winters when due to cold weather outside he can’t do anything else. In summers he will have his farms to take care and also he works on his wooden products like showels etc which he sells to other farmers. While talking about the challenges and effort of his work on metals Thetan ji mentioned us that the younger generation is not taking this art and it will die very soon. 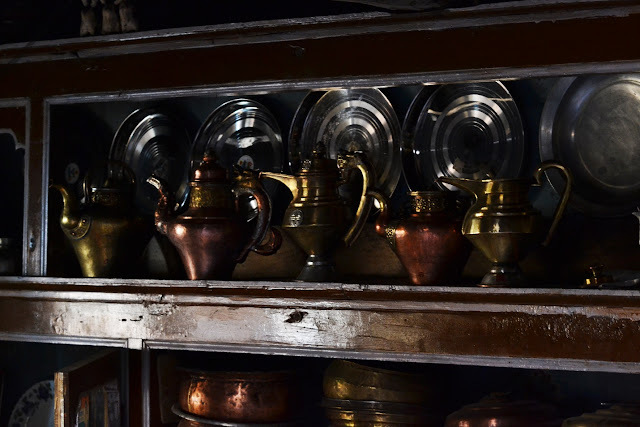 He showed us his art, the kettles that he makes, Each kettle usually takes 2-3 weeks of time. A lot of this work involves beating and shaping of metal sheets. And as the returns are less, the younger people prefer to travel to Leh and do some other better paying work. 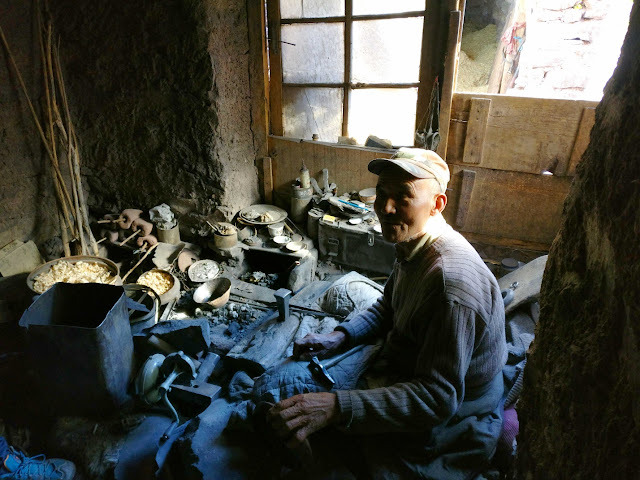 On our further survey we found this village has only 2 copper artisans, both above 60yr old. The art has vanished from many villages of Ladakh and is now left only to 2 other villages. At one of the village, named Sumda Chenmo, there is only 1 artisan left. This data was very sad as we will be losing this age old heritage in next few decades if no steps are taken soon. 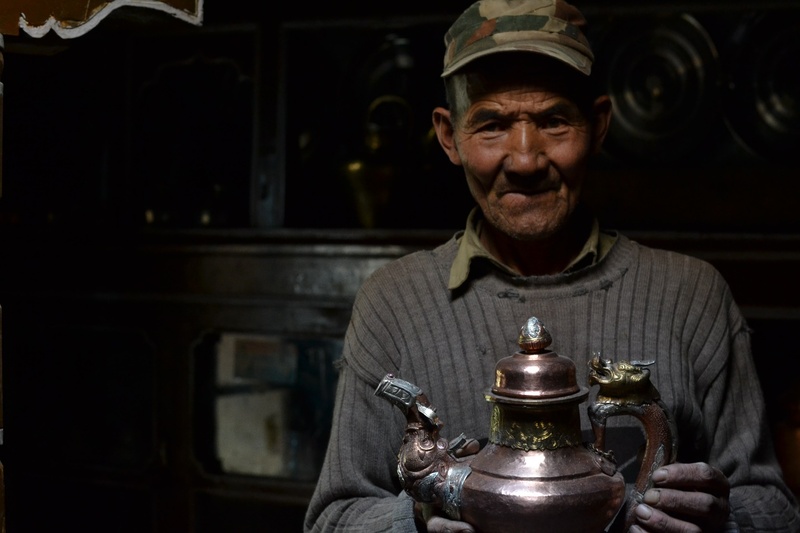 Many villages in Ladakh do not have electricity as of now. Thetan mentioned how having electricity can ease his work and also encourage the youth to stay in the village and embrace this art. With my team at Mountain Homestays we are also trying to find alternatives for these artisans to save this art. On one side we want to introduce some more designs and products that could be made without losing the essence of this art. On other side we plan to create a better market access for these products as well. On the basis of the result of the Civil Services (Preliminary) Examination, 2016 held on 07.08.2016, the candidates with the following Roll Numbers have qualified for admission to the Civil Services (Main) Examination, 2016.
of the Union Public Service Commission . online and submit the same ONLINE for admission to the Civil Services (Main) Examination,2016 to be held from Saturday, the 3rd December, 2016. The DAF (CSM) will be available on the website of the Commission from 7th October, 2016 to 20th October, 2016 till 6.00 P.M.Important instructions for filling up of the DAF (CSM) and for submitting the completely filled application form ONLINE, to the Commission, would also be available on the website.The candidates who have been declared successful have to first get themselves registered on the relevant page of the website before filling up the ONLINE DAF. The qualified candidates are further advised to refer to the Rules of the Civil Services Examination, 2016 published in the Gazette of India (Extraordinary) of Department of Personnel and Training Notification dated 07.08.2016, which is also available on the Website of the Commission. It may be noted that mere submission of application form DAF(CSM), either online or the printed copy thereof, does not, ipso facto, confer upon the candidates any right for admission to the Main Examination. The e-Admit card along with the time table of the Main Examination will be uploaded on the Commission’s Website to the eligible candidates around 2 weeks before the commencement of the examination. Changes, if any, in the postal address or email address or mobile number after submission of the DAF (CSM) may be communicated to the Commission at once. Candidates are also informed that marks, cut off marks and answer keys of screening test held through CS (P) Examination, 2016 will be uploaded on the Commission website i.e., www.upsc.gov.in only after the entire process of CS(M) Examination, 2016 is over i.e. after the declaration of final result of Civil Services Examination, 2016. The Union Public Service Commission have a Facilitation Counter near the Examination Hall Building in its Campus at Dholpur House, Shahjahan Road, New Delhi.Candidates may obtain any information/clarification regarding their result of the above mentioned examination on all working days between 10.00 AM to 5.00 PM, in person or on Tel. No. 011-23385271, 011-23098543 or 011-23381125 from this Facilitation Counter.Candidates can also obtain information regarding their result by accessing Union Public Service Commission Website www.upsc.gov.in. The results of Roll Numbers 0634752, 0618691, 0980111, 0892863, 0147967,0767132, 0891391, 0993625, 1075321, 0682468, 0719476 and 0612141 have been withheld as the issue regarding their candidature is subjudice. Quality education at all levels is very important for any nation to build up a stronger economy. Updated syllabus with time, flexible options to choose the courses as per the area of interest, passionate experienced teachers, research oriented environment and politics free educational campuses are few of the key factors to bring quality education. Indian education system is lagging behind in some way from the developed countries. Although our graduates have been getting key positions and plum posts around the world, we have some basic faults at primary level itself. Our system is marks-oriented and rewards them who perform well in exam with predefined answers. Research environment is very much lacking straight from root level itself. Currently the government of India is also taking various measures to bring our entire education system as per the world standards. Government run institutions like IISc, IITs, IIMs and NITs are trying their level best to provide quality and research oriented education. Few private institutions are also doing very good job in revamping our traditional ways of education. 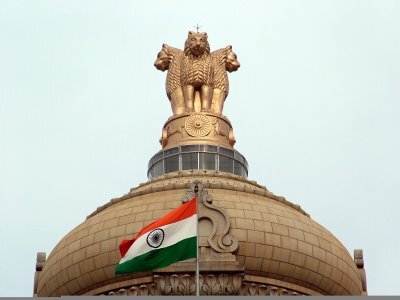 Several private universities are approved by University Grants Commission (UGC), New Delhi which have been showing excellence in quality of education and are running various courses in collaboration with several reputed universities worldwide. VIT Vellore, BITS Mesra, Manipal University, BITS Pilani, S P Jain School of Management are some of the reputed private institutes all across the country for various courses. 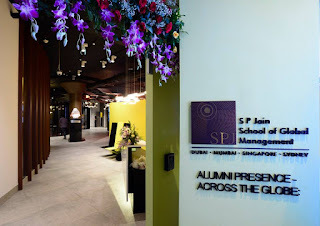 S P Jain School of Global Management ranked #10 by Forbes in the "The Best International Business School" in the world for its one-year MBA program. It has campuses in Sydney, Mumbai, Singapore and Dubai. With the fact that it was established in 2004, within 11 years of its establishment, it has shown very high level of academic excellence by its innovative model to provide quality education to its students. Several reputed agencies have acknowledged this institution and ranked it among top business schools in the world for MBA rankings. The Economist ranked S P Jain School of Global Management in the world's Top 100 for its full-time MBA program in 2015.The one-year full time MBA at IIM A, the one-year courses at ISB, Hyderabad and S P Jain School of Global Management, Dubai are the only MBA programs to have been ranked in the global ranking of MBAs by Financial Times, London - widely regarded as the foremost ranking in the world. 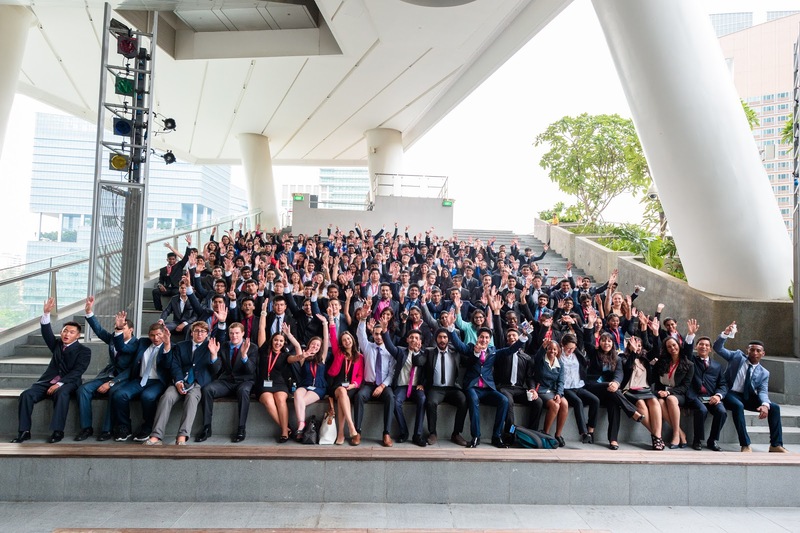 BBA (Bachelor of Business Administration), BEC ( Bachelor of Economics) BBC (Bachelor of Business Communications), GMBA (Global Master of Business Administration) and EMBA (Executive Master of Business Administration) are some of its world class courses offered which have been designed in such a way that all these programs provide global exposure, flexibility, research oriented environment to students. Students are offered to study at different global campuses during the course. International faculties join in from different academic and corporate backgrounds with a high level of expertise, knowledge and passion. Up to date course materials, international case studies and independent research projects give an edge to its study programs. S P Jain is accredited for its Global MBA program by ABEST21, The Alliance on Business Education and Scholarship for Tomorrow, Japan. ABEST21, promoted by Ministry of Education, Japan is a recognised accrediting organisation committed to excellence in business management practices and education. The tri-city model of S P Jain School of Global Management brings the difference. As per this model, students have to study and live in Singapore, Sydney and Dubai to get the real global business exposure. This model provides important global business skills resulting into better jobs, salaries and final outcomes. Mumbai campus was established to meet the growing demand from the huge Indian business school market. The school is promoting self-directed learning by experiencing and experimenting the things where the retention level is much better in comparison to old method of simply blackboard-chalk teaching. Students from different nationalities meet and interact each other during the course and stay at its different campuses which help them to understand different people and parts of the world from several angles. Due to very good networking with several companies around the world, this school provides very fair chances of campus placements. Several of its alumni are placed in reputed companies throughout the different geographies. India needs many institutions of this kind to provide quality education to its youth to not only find the right jobs for them but to become job creators to provide jobs to others. India is going to have very large workforce that needs to be utilised in different sectors in coming years. ”Start-up India“program started by the PM Modi recently is also one of the steps forward.